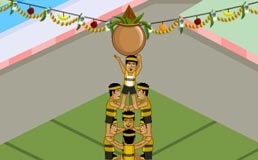 Arrange the guys correctly to form a stable ladder and reach for Dahi Handi, before time runs out. Instruction: Drag the guys in the correct order.Your aim is to reach the top as soon as possible within the given time.You have to complete a circle below before adding guys on the top level.The guys will not change direction so make the right combination to avoid falling down. Be careful to place the guys on top precisely or else they may slip.